Tonight is the night that years of scientific research and engineering will either pay off, or fail spectacularly. This is one of those moments in scientific discovery that merit staying up all night, or setting an alarm to wake up and watch. Mars Curiosity is scheduled to land tonight at 10:31 p.m. PDT, Aug. 5 (1:31 a.m. EDT Aug. 6). 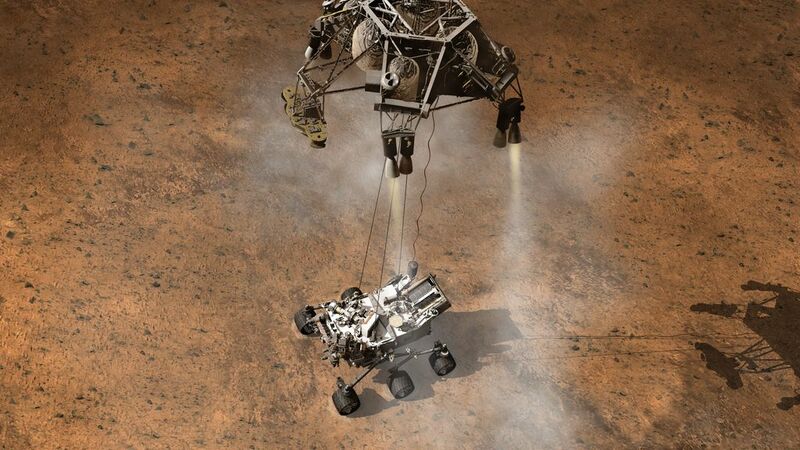 Curiosity will reach the surface in a way that no space craft has ever landed — it will be lowered to the surface on nylon cords by a rocket-controlled hover crane that will return to orbit after the drop. This entire process is automated and expected to take seven minutes. If you aren’t an expert on the mechanics of how this whole process occurs, take five minutes and watch the latest NASA JPL video titled: Challenges of Getting to Mars: Curiosity’s Seven Minutes of Terror, below. When the Mars Science Laboratory (MSL, also known as Curiosity) launched November 26, 2011, it started a scientific expedition like no other before it. While the majority of the modules on the MSL won’t start collecting science data until it powers up on the Martian surface, one instrument has already logged 221 days of scientific data: The Radiation Assessment Detector (RAD) has been taking readings of the ambient radiation on the entire voyage to Mars. RAD has recorded five separate solar flares. According to the RAD principle investigator, Don Hassler of the Southwest Research Institute (SwRI) in Boulder, CO, this data has already been used by scientists planning future manned missions. Once Curiosity safely lands on the surface of Mars the rest of the science activities begin. Curiosity’s main science objective is to look for areas on the Martian surface that could have sustained microbial life. The Gale crater was chosen as the perfect landing site because it shows many of the properties of formerly aqueous terrain, but its small 12-mile landing zone has always made it too risky to attempt a traditional air bag landing. Assuming all goes well tonight, the Martian rover — which is as big as a VW Bug — will increase our knowledge base of the Red Planet for years to come. If you would like to catch your own piece of Mars Curiosity fever, head over to the Mars Curiosity Lego CUUSOO site and lend your support to turning it into a retail model.